Ah, spring is here. Despite the pollen storms, I absolutely love North Carolina at this time of year. There are sprouts of green emerging everywhere but the humidity has yet to take hold. It’s a very inspiring time full of growth and possibilities. Which leads us to the big news… You know I only send out a newsletter when I have actual news. So, what’s the news? First, I want to say that I appreciate how supportive everyone has been of my pastries. Writing these recipes and building the Triangle Pastry Co. brand from scratch and putting out into the world was scary at first, but turned into a very fulfilling and rewarding experience because of you. I am so glad to be part of your weekly routines as you shop for fresh, local, and delicious food at the markets. This dedication really motivated me to seek a permanent outlet for my baked goods and is what led me to this well-timed opportunity. I am so stoked to share this with all of you. I am going to be producing the bakery menu at Copeland Springs Kitchen! 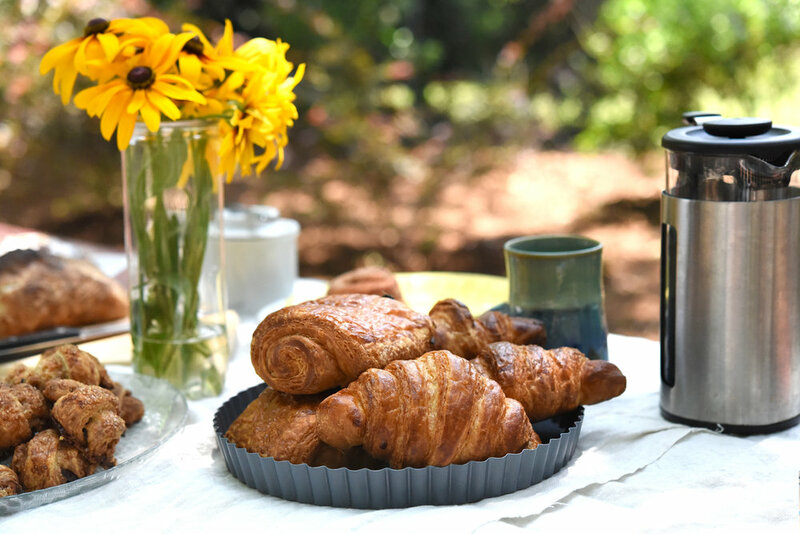 What was originally Triangle Pastry Co. bread and select favorite pastries will now be available, at the Copeland Springs market tent and at the brand new Copeland Springs Kitchen, which has a projected opening of May/June 2019 in Pittsboro. Copeland Springs Farm and Kitchen (click here to follow on Instagram) is a certified naturally grown, farm-to-table initiative which promotes sustainability for a healthier community. It is owned and operated by Kristin Bulpitt, who is a visionary contemporary farmer making strides against hunger and developing real solutions for nourishing our community. •Wholesome meals. We love making delicious food for you with said veggies. •Regular hours in addition to markets. You’ll want to come visit often for these fresh ingredients, your favorite baked goods, mouthwatering meals, happy people, and let’s not forget the ambiance or other attractions around the Plant. If you have not yet signed up for the Copeland Springs CSA program, you can check it out here and pick up your share at the Apex Farmer market. Don’t miss all of the great add-ons to the standard farm share, like bread (made by yours truly) and eggs. As a bit of a side note, if you ever smiled at the beautiful flowers on the Triangle Pastry Co. market table (how could you not??? ), those came from Copeland Springs Farm. Second, and relatedly, I am now a member of the Apex Farmers Market advisory board, for which I will be helping with producing photography and related content (be sure to follow the Apex Farmers Market on Instagram). So I will still be around on Saturday mornings and I hope to see you there! Thank you for supporting amazing local businesses and realizing the value and strength in community! Cheers!